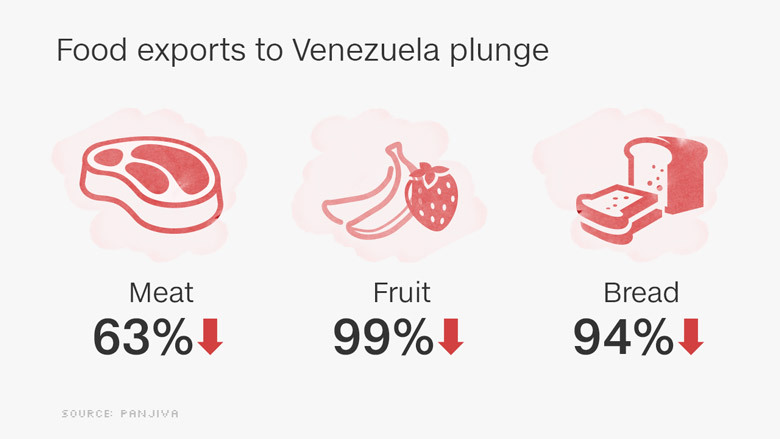 You name it, Venezuela is short of it: Meat, fish, fruits, sugar and bread. The government just doesn't have enough money to pay for them. It's created a staggering humanitarian crisis in Venezuela, where citizens don't have enough food to eat. Looting and riots have rocked the country. The declines in exports of certain food categories are staggering. Bread shipments to Venezuela fell 94% in the first half of 2016 compared to the the same period last year. That's $216,000 worth of bread this year, versus $3.5 million last year. Venezuela's economy has plunged into a deep recession and the country is fast running out of cash. The key problem behind Venezuela's inability to pay its bills is that the value of its currency, the bolivar, has plummeted dramatically in the last couple of years. That's made paying for food imports prohibitively expensive. However, exports of a handful of basic foods did go up. U.S. corn exports to Venezuela rose to $239 million from $140 million last year. And vegetable exports rose to $270,000 from $102,000. Panjiva's numbers parallel other, broader estimates. Bank of America (BAC) forecasts Venezuela's total imports dropped between 40% and 45% in the first five months of this year from last year. Venezuela's government doesn't publish reliable import data. Venezuela is the world's worst-performing economy this year, according to the IMF. Its economy is projected to shrink 10% this year and inflation could skyrocket over 700%. The government seems to have prioritized its debt payments over food shortages. 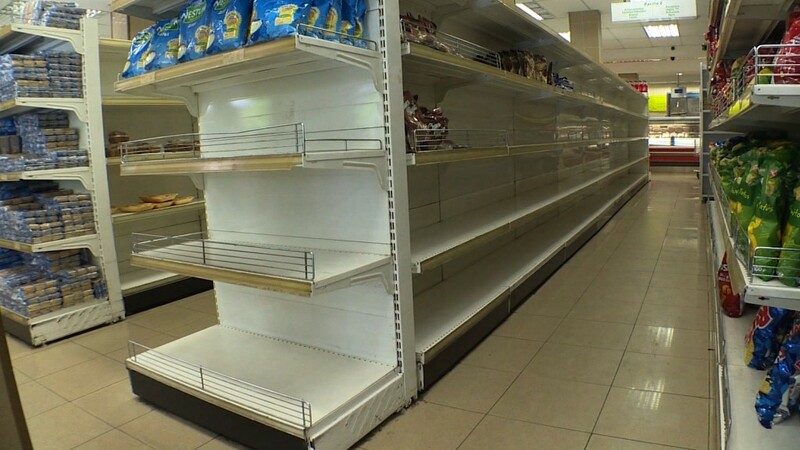 Venezuelans wait in lines outside supermarkets often for hours only to find empty shelves. It's hard to find bread, eggs and other basic items. The country is also short on basic medicines, leaving some to die in hospitals and many to languish without proper treatment. It's an especially tragic situation because Venezuela has more oil reserves than any other country in the world. Plus one of its neighbors, Brazil, is among the world's top food exporters. Venezuela has denied food and humanitarian aid from groups like Amnesty International and the United Nations. Amnesty officials contest that the government doesn't want to accept aid because that would make the government look inadequate. Despite its focus on debt payments, Venezuela is actually struggling to pay those bills too. With oil prices having plunged in the last two years, Venezuela's state-run oil company, PDVSA, is next to broke. In April, Schlumberger, which provides oil-drilling equipment and technology, said it would lower its services to Venezuela due to unpaid bills. With less drilling capability, Venezuela's oil production has fallen to a 13-year low. Now Venezuela's government, led by President Nicolas Maduro, is trying to revamp the country's agricultural sector, which long lacked significant investment, to address the food shortages, experts say. Maduro issued a decree in July that would force citizens to work on state-owned farms for up to 60 days and perhaps longer "if circumstances merit." So far, there have been no cases of forced labor, but Amnesty claims the decree amounts to "forced labor."